It was not raining when Noah built the Ark. “The prudent sees danger and hides himself, but the simple go on and suffer for it.” Proverbs 22:3. At this time of crime, violence and instability, it makes sense to study this practical and positive handbook on security and survival. As a Mission of Christians from a military background, dedicated to serving persecuted Christians for over 35 years, Frontline Fellowship missionaries have experienced ambushes, aerial bombardments, rocket and artillery fire, thefts, terrorism, capture and imprisonment. Utilising the lessons learned through these decades in conflict areas, comes this unique, practical and compact Security and Survival Handbook. If strikes and civil strife cause your water and electricity supplies to be cut off, would you have alternative supplies? If your home, or church is attacked by terrorists, would you know what to do? Does your Church, or mission, have contingency plans? On a daily basis, how secure are your loved ones and your possessions? Does your church, or mission have a Security Committee, or a person designated and responsible, to consider likely scenarios and take the necessary steps to counter those dangers? Do you have a regular sport, or exercise routine to keep you fit, alert and healthy? What can you do to strengthen the security of your home, church or mission? What steps can you take to make your congregation, or mission, a less attractive target for terrorists? This book could save the life of yourself, your loved ones, fellow church members and fellow missionaries. 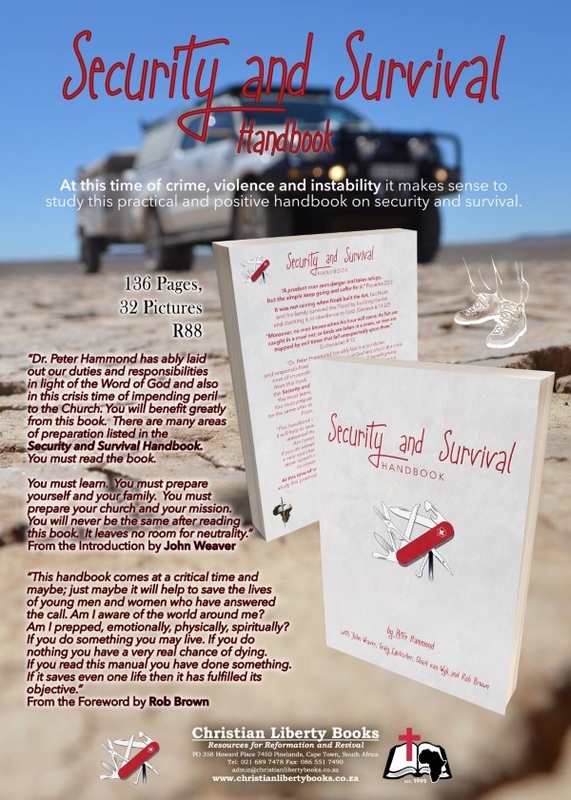 Security and Survival Handbook is available at R88 a copy from Christian Liberty Books, PO Box 358, Howard Place 7450, Cape Town, South Africa, Tel: 021-689-7478, Fax: 086-551-7490, Email: admin@christianlibertybooks.co.za and Website: www.christianlibertybooks.co.za.